What a card! I knew it was going to be a great card. The lineup was great, with a lot of dream matches for casual and/or elitist MMA fans. I have been looking forward to some of the fights on this card and they didn’t disappoint; while others were as bad as I thought they were going to be, if not worse. I was off on some of my predictions, and I was a little disappointed by the outcome of some of the fights, but overall it was a great card. This time I didn’t go out to watch the fights like I usually do. I usually watch the fights at Sports Grill in South Miami because the drinks are always nice and cold, and the food is really good, especially their “chicken teriyaki chicken wings”. I watched the fights over at my fellow MMA enthusiast’s home, since he just had a baby. There was plenty of pizza, but I had to bring my own beer, since my buddy doesn’t drink. I bought a four pack of PBR and I was ready to watch the fights. After some early under card action, we saw Ricardo Lamas take on Jason Knight. Knight has been on the rise recently and Lamas is a veteran of the sport and ranked very high. As Knight was getting up after a submission attempt, Ricardo took advantage and just laid waste to Knight’s face, showing off his superior boxing skills. The ref stopped the fight. I called it. I originally thought Ricardo Lamas would win by decision, but had an awesome win by TKO. Ricardo has skill and power, and hopefully he will get a title shot. Jimi Manua has been killing it in the light heavyweight division… well, kind of. I mean, he did lose to Anthony Johnson and Alexander Gustaffson, but they’re at the top of the division. He was up against Volkan Oezdemir. Oezdemir let loose and was just too much for Manua. He came in with too much speed and power, pushing Manua off from the clinch and moving forward, knocking the hell out of Manua. The fight ended in 00:42. Oezdemir can make it far in this division, considering some of its top fighters have left to Bellator and are too beat up, and should retire, in my opinion. At this point I’m on my third beer and stuffed full of pizza. Robbie Lawler vs Donald Cerrone! At this point I’m on my third beer and stuffed full of pizza. Two great strikers, one Muah Thai, the other a brawler! I had predicted that the way Lawler was going to win was to just rush Cerrone and pressure him early in the fight. And what you know? That’s what he did. The bell rang and Lawler laid on some serious pressure, landing bombs and pushing “the Cowboy”. Lawler immediately started using his dirty boxing pressure on Cerrone, who’s a fighter that takes a while to warm up, or find his range before we start seeing what he’s really about. Watching Lawler fight is always entertaining because someone is leaving bloody. That’s not to say that Cerrone didn’t put a beating on Lawler. while in the clinch, Cerrone was landing beautiful elbows, some that rocked Lawler, and as the fight progressed, Cerrone was starting to find his range and landed some classic leg kicks to Lawler’s head. In the third round, Cerrone was overwhelmed, he was fighting defensively while Lawler was landing bombs and controlling the fight. Lawler won by unanimous decision. Called it. First title fight of the night. Cris Cyborg vs Tonya Evinger. Evinger was the Envicta Bantamweight Champion. Originally, the fight was supposed to be Cyborg vs former featherweight champion Germaine de Randamie, and de Randamie just didn’t want to get murdered. The fight lasted longer than I thought it would; respect to Evinger. She can take a beating. Cyborg was landing devastating shots to Evinger’s head. The majority of the fight consisted of Cyborg landing bombs. Evinger did a great job not dying, and she avoided some of the shots, but in the third round, Cyborg landed a hell of a knee and Evinger was done. Cyborg won the title. In a welterweight division fight between Tyron Woodley and Damian Maia, it was a fight long time coming for Maia, as he has cleared the division in a very dominant fashion. Tyron Woodley has become a safe fighter. He’s just fighting for the win, not really to entertain us. The fight was basically Maia shooting for a takedown, Woodley stuffing it, and walking away. Woodley did do some damage to Maia’s face, but besides that, nothing happened. Woodley won by unanimous decision. I respect Maia. He is one dimensional and only seemed to implement one plan, but at least took a risk. He was willing to get his face pummeled the few times that Woodley did attack and he was more aggressive. After that snoozer we got what we had been waiting for: the rematch between Daniel “DC” Cormier and Jon “Bones” Jones. Finally, after all the trash talk, twitter wars, and straight-up beef, they finally face each other… again. Considering these two have wrestling foundations you’d think there was going to be more takedowns, or more attempts to a takedown, but no, they just wanted to duke it out. After having trouble with the law and being out of the ring for a while, I thought Jones would’ve suffered ring rust. Nope. Jones was precise and calculating. He was attacking the knees of Cormier with his push kicks. I was afraid he was going to dislocate DC’s knees. Cormier was hitting Jones with great combinations. He was putting pressure on Jones, landing uppercuts, over hands, and kicks. Jones was picking apart DC with the leg kicks and his own shots. The ref stopped the fight, crowd goes crazy and we have a new champ. In the long run Cormier was being overwhelmed by Jones and was being slowed down by Jones’s leg kicks. Towards the end of the second round it was clear that Cormier was not going to walk away the champ. He was breathing hard, and kept having to chase down Jones, missing more of his punches and losing his composure. There was one take down in the whole fight, but Jones was able to get back up immediately. Jones threw a head kick in the third round, which shook Cormier. He took down DC and laid waste to him with elbows and punches. The ref stopped the fight and the crowd went crazy. We have a new champ. It was disappointing to watch because I’m fan of DC. I have been a fan since the beginning. He’s a former Strikeforce fighter with an amazing record, and a former UFC heavyweight champion as well. He cleaned out the division and moved down to light heavyweight, so he wouldn’t fight teammate and former heavyweight champion Cain Velasquez. He cleaned out the light heavyweight division and won the vacated title when Jones was stripped from it. But, that night Jones came in hungry as hell. He is a very smart, calculating, and adaptive fighter, and he sure proved it at 214. Like I have said, I like MMA because you can watch a fighter from his humble beginnings, to when he becomes a champ, and until he finally retires. Cormier was very emotional over his loss, but so what, he has every right to be emotional. He climbed the ladder against the odds, fighting guys bigger than him and with more experience, to finally get the gold. But, I cannot deny that Jon “Bones” Jones is probably one of the greatest fighters of our time, and there’s no shame in losing to him. Well, cheers guys! 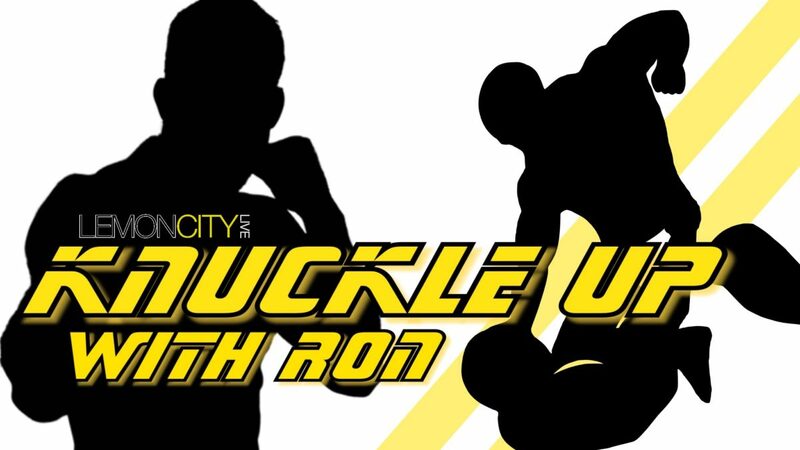 Knuckle up with Ron is a column in which an MMA enthusiast will bring you the latest news, opinions and what else might be happening in the world of MMA. You’ll get unique articles and a humorous perspective on this growing sport from the mind of a not so typical Miami resident. We’re not claiming to be experts, we’re just here to give you our thoughts, so make sure to comment and follow us on Twitter, Facebook, and Instagram. About the Writer Ron Diaz is an amateur writer, MMA enthusiast and amateur artist. Been watching the sport since the days of Pride, and at one point trained in BJJ, Kickboxing, and wrestling. You can catch me at Sports Grill watching PPV fights enjoying some wings and a cold beer.